Well done to all that participated! 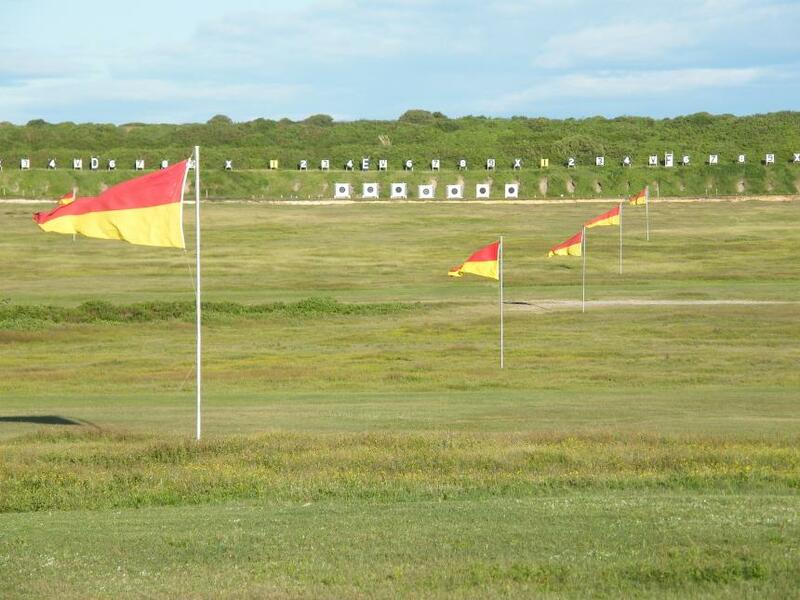 The weather was pleasant, the wind conditions weren't to bad and the Electronic targets functioned well.. A great day all round. Windy conditions met competitors with predictions of gusts going to reach 70 KM/H by the late afternoon, the wind changed in strength 12mph to almost 20mph) and direction (from 3-30 to 5 oçlock'). 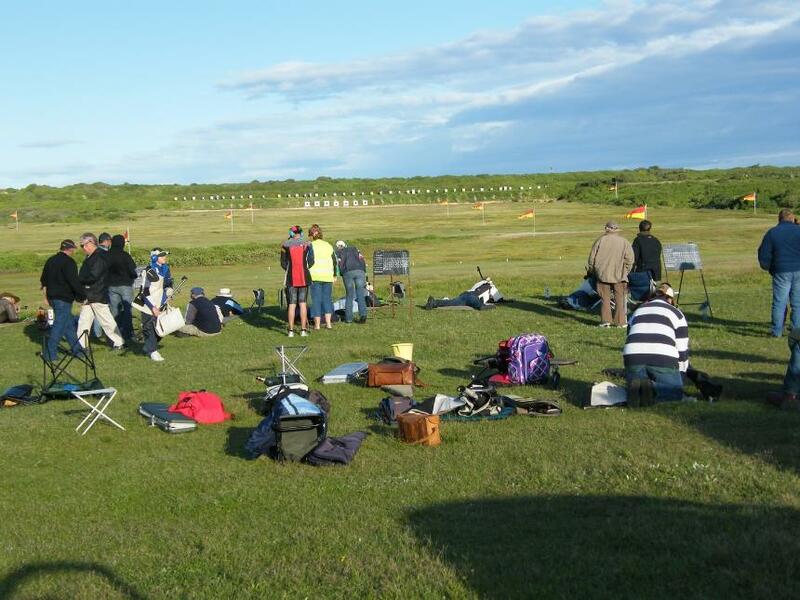 Some shooters had patches of the worst conditions resulting in a shot or two in the 1, 2 or 3 ring, right wind extremes were between 1.5 points to 9 points, (most shots fired between 4 to 7 points of R/W) however some competitors got a good patch and they made use of it, the F Standard winner Ralph Garlick of Lyndhurst fired his sighters and 11 scoring shots in less than 3 minutes, scorers had trouble keeping up, but the electronic target didn't recording all his shots as they landed on the target. Ralph won his category by 1 centre from Steve Hart with Matt Paroz third 1 point further back. A good turnout of almost sixty shooters turned up to support the MDRA Anzac Day OPM which has been running for many years. TR A Grade was won by Michael Millen of MNB by a margin of 3 centres from Angus Bell of Port Jackson, while in B Grade Ian Trevathen of Yorkshire won decisively and C Grade was won by Alex Davies of West Wallsend. All present on the mound paused prior to the start of the second range for a brief Anzac Day commemoration. Bill Barry read the Ode and a minutes silence was observed with all present facing to the west. The MDRA would like to thank all those who braved the elements, both competitors and workers. Special thanks to Kevin Schwebel, Wendy McGuigan, David Asper and Angus Bell plus others who helped to allow the shoot to be conducted, special thanks to Bankstown-Chatswood R C members in particular. Our thanks to the CRO Lyn Harvey and the young runner on the mound Ron Spithill. It must be more than a coincidence that Anzac Day fell on Easter Monday AND that it was also a generally wet and miserable day. 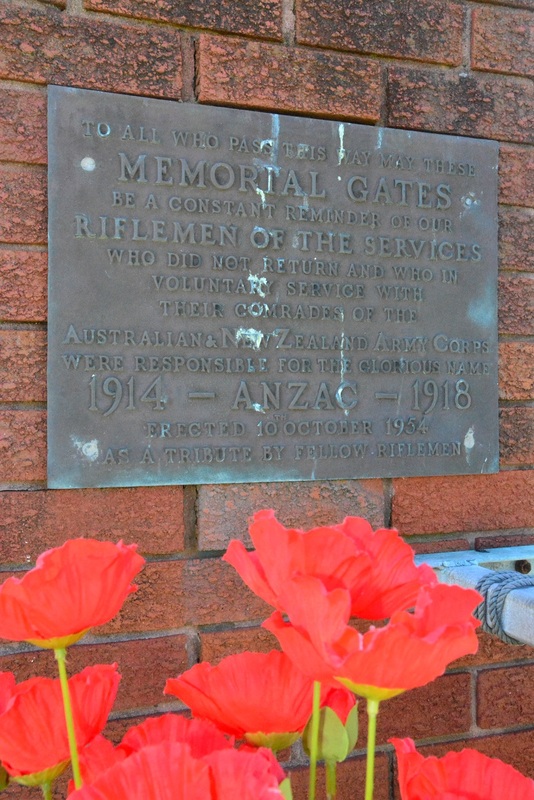 Rain and Easter seem to be closely connected so it was not all that surprising that dawn services in Sydney were conducted in the wet. This has been the case in three of the last five years. Conditions improved slightly during the morning. By the time the shoot started soon after midday the rain had backed off enough to allow us to proceed. 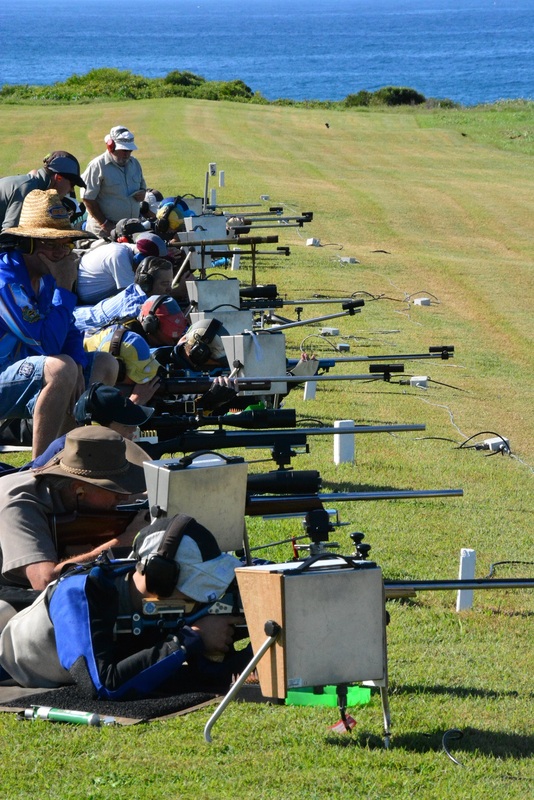 But the 500m mound was waterlogged and the program had to be changed to two stages at 600m with the second being the traditional 11 shots to count. Electronic targets were in use. 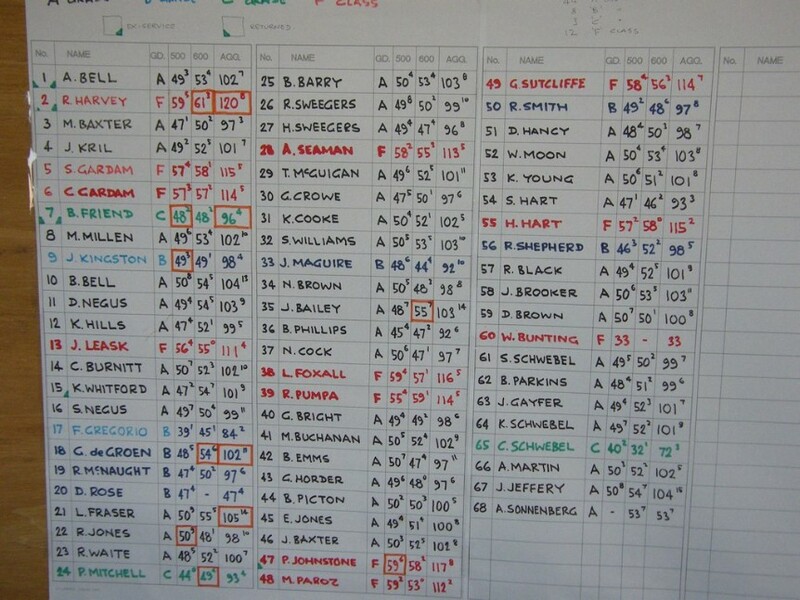 As expected the combination of Easter and poor conditions resulted in a low turnout of 33 entrants, slightly under half the average of recent years. Competitors were met with challenging varying winds with the occasional passing shower and this was reflected in the scores. 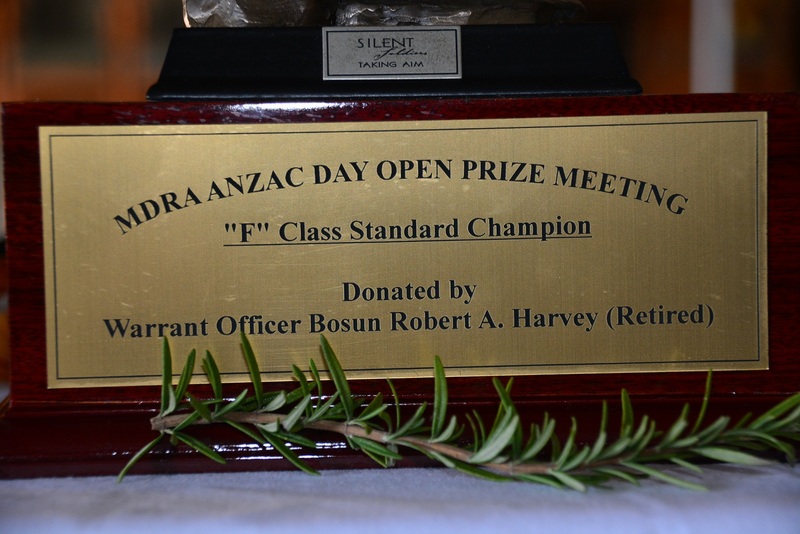 In an unusual example of history repeating itself both the A and C Grade aggregates were won by the same individuals who won these grades at the two day Festival of Sydney prize shoot in January. 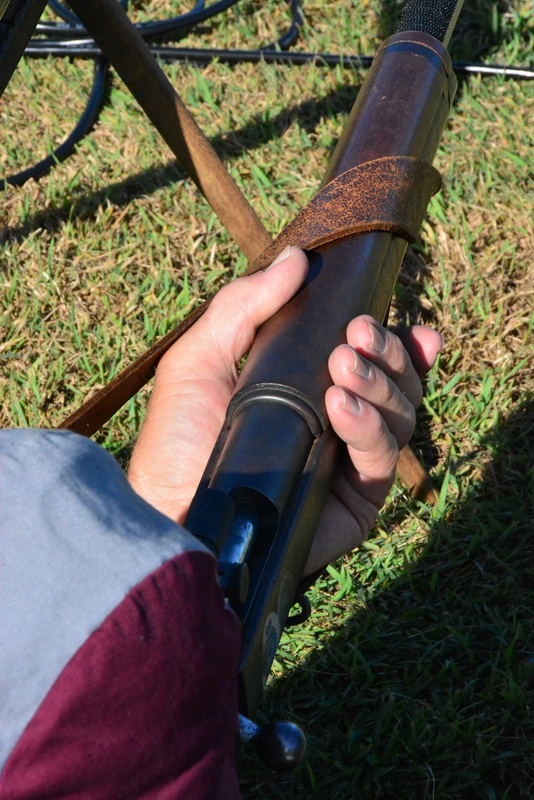 A Grade winner Bill Ballantyne drove back from the Mudgee Easter shoot on Sunday evening then fronted up at Malabar on Monday afternoon. He brought his good form with him to record a win by one centre from Andrew Sims. Bill was one of the last to complete his second stage and a shoot-off seemed as likely a result as any at one stage. F Standard was also close though not to the same extent as A Grade. Regular visitor John Peters from Cessnock led from the first range to sneak home in front of Matt Paroz and David Peters by one point with Matt needing a countback to claim second place over David. The B and C Grade results were a little more clear cut. In B Grade Fernando Gregorio achieved a win by three points with Geoff Ayling in second place. Geoff was also the top scoring ex-serviceman. The second leg of the MDRA “daily double” was completed by Chris Schwebel who won C Grade with good consistent shooting and very few mistakes. The MDRA would like to thank all those who braved the elements, both competitors and workers. Special thanks to Kevin Schwebel and Wendy McGuigan who both put in considerable effort in the lead up to this shoot. 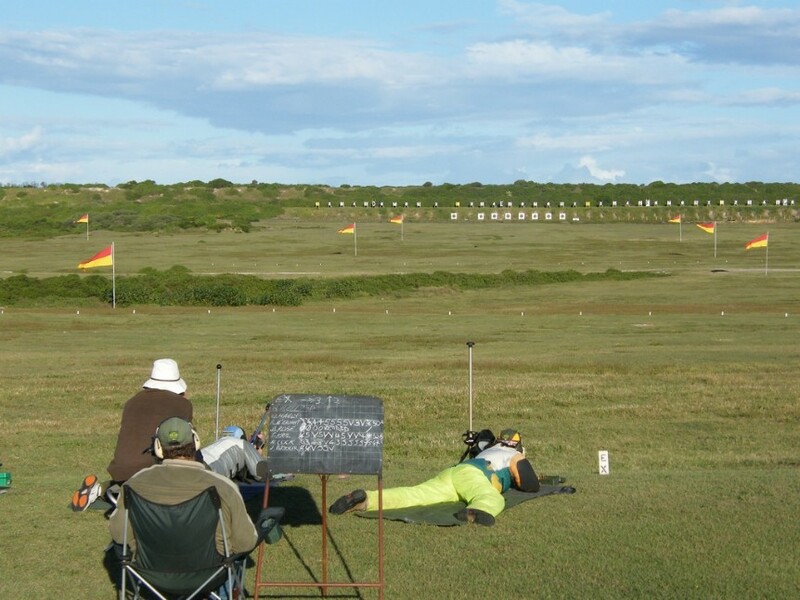 Our thanks also to the clubs of the MDRA who lent us their valuable targets and monitors, and to our CRO Ron Spithill. 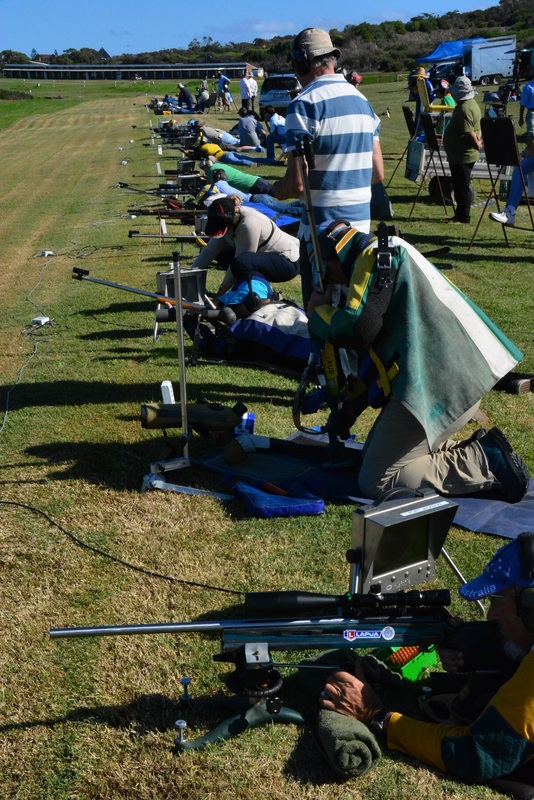 This year marked a return to the long standing format of ten counting shots at 500m and 11 counting shots at 600m. Entry was down slightly at 68 competitors versus 71 last year (which was held on a Saturday). Shooters in town for the State v Rest match the next day helped boost numbers. Members of the Rest and State teams filled all bar one of the spots in the top ten but it was Rest team member Les Fraser of Lyndhurst RC, who took the aggregate with the only perfect score on the day. Les has been performing very consistently in recent times and was also among the top scorers in the following days teams match. Jim Jeffrey, also from Lyndhurst, and Barbara Bell from Holsworthy RC, were close behind in second and third places respectively. Jim was the top scorer in the State v Rest match. 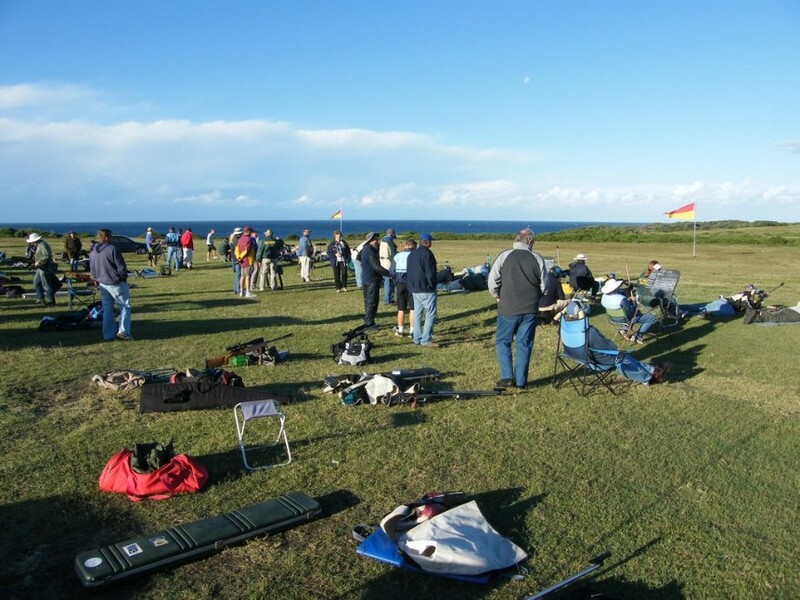 F Standard was won by Robert Harvey of Marrickville RC, with a fine 120 (ex 126) ahead of club mate Peter Johnstone on 117. 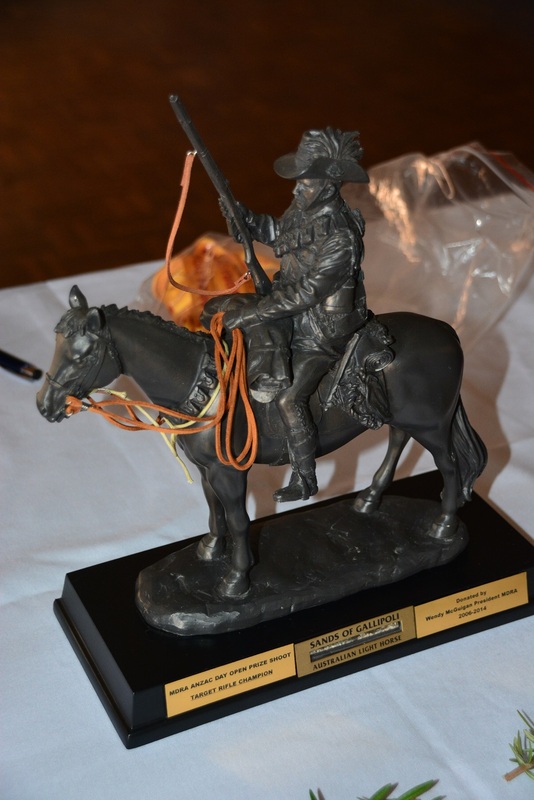 Robert also won the perpetual trophy for Returned Servicemen. 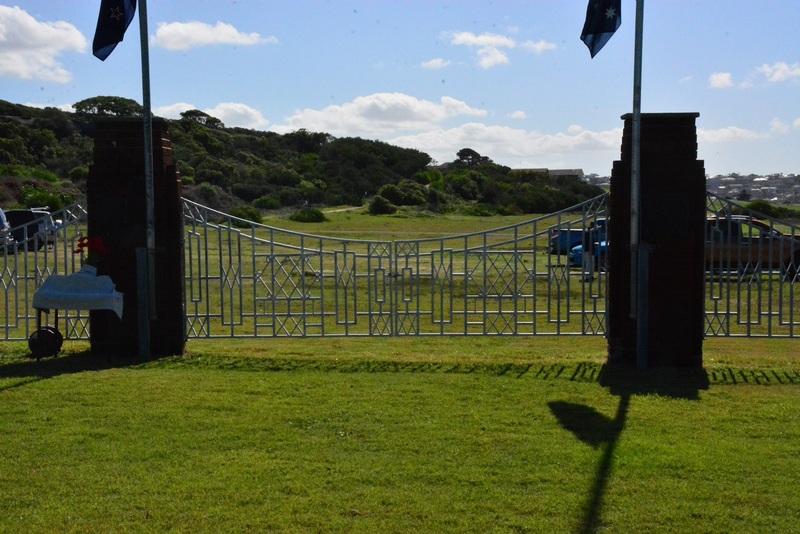 Gordon de Groen of Sydney RC had a clear victory in B Grade with a highly creditable 102.11, primarily a result of his excellent shoot at the trickier second range. Gordon narrowly avoided being re-graded as a reward for this achievement. Numbers were down in C Grade but it was good to see young Chris Schwebel from Holsworthy RC competing in what I believe is only his second prize meeting. Watch out Kevin, you'd better start getting some more practice in. 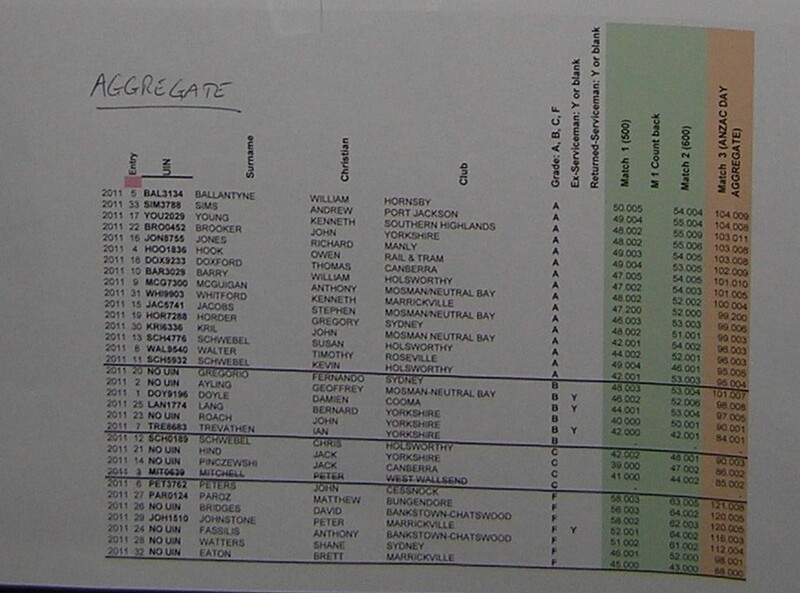 The aggregate winner in C Grade was Brenton Friend of Marrickville RC. Competitors and organizers all paused at the mound prior to the start of the second range for a brief Anzac Day commemoration. 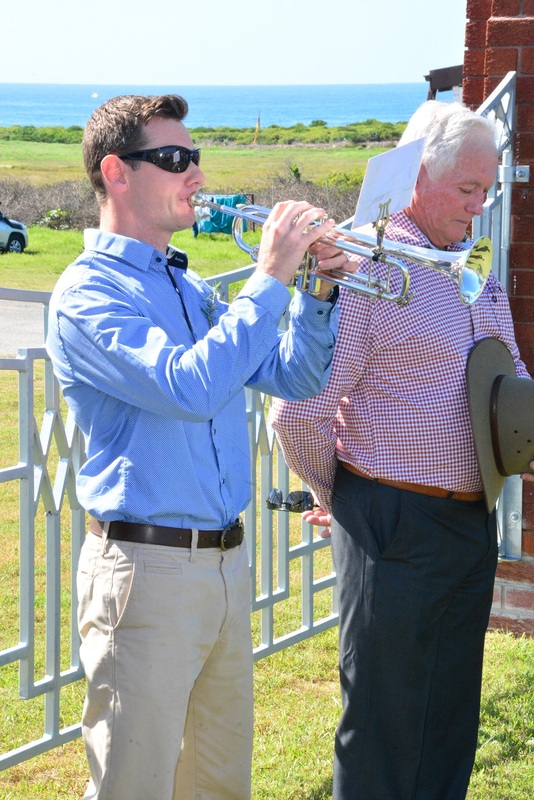 Bill Barry read the Ode, Evan Jones played the Last Post, and a minutes silence was observed with all present facing to the west. Our thanks to Bill and Evan for conducting this ceremony once more. One item worth noting from the post shoot presentation was the big round of applause for Metropolitan DRA President Wendy McGuigan who as usual was tireless in organizing and helping run the DRA on a general basis and for this shoot in particular. Thanks also to "Little Wendy" aka Donna Negus who was a driving force in the running of this event.